Considering Stone Age, Loch Ness and Santiago de Cuba but haven't played any of them. Stone Age is a good choice. Fauna - no girls or boys, but animals and they might learn a thing or two. 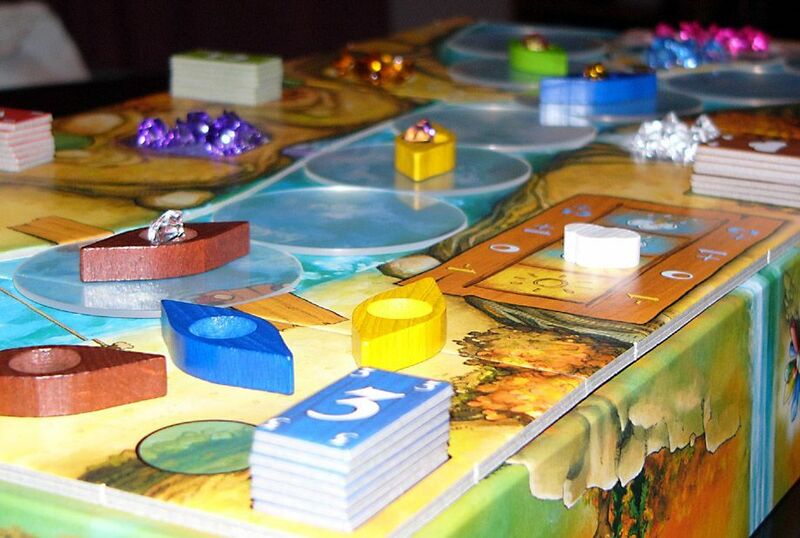 Niagara - A beautifully produced game about collecting gems from the banks of the Niagara while avoiding falling off the waterfall. My girls are the same way when it comes to female characters. I know there are non-violent game with female characters as I can see them in my head but I can't quite remember what games they are. Many games with characters have some form of abstracted violence in them. Depending on your definition of violence you could check into The Adventurers: The Temple of Chac and The Adventurers: The Pyramid of Horus. They are press your luck games that do involve player character death via traps. Think Indiana Jones. Flash Duel: Second Edition is a fighting game so it is violent but it is excellent for kids. The mechanism is a great counting and deduction system, it has several female characters and it can be played as an all of them against you. My only issue with The Adventurers: The Temple of Chac is that the female bits are busting out all over. That may not give your girls the kind of message you want. I tweaked our character cards in photoshop, and left our figures unpainted so it isn't quite so noticeable, but it still irks me. Perhaps they would like Takenoko. No girl characters but an adorable panda! Forbidden Island and Forbidden Desert are non-gender specific, cooperative and I like that the game board is always different. Nuns on the Run only has female characters, and it involves novices trying to sneak around the Abby at night without getting caught. How about Pastiche? It has no characters, no meeples. It's about blending colors to create pictures. All three of your daughters will be able to play it. I should have checked whether it's still easily available, but I didn't. Another game without male or female characters is Finca. It does have meeples, but they aren't associated with any particular character. I've taught it to a 10-year old who caught on right away. awesome, thanks! daddy's got some homwork to do tonight researching these! Takenoko is a good choice. One of the cutest games in my collection that always gets a lot of "Awwww"s when I bring it to the table. And...it's a good game. Good luck! It works for all ages, is a good mix of simplicity plus strategy, and girls like the theme, in my experience! I have a 12YO and a 5YO. They love Forbidden Island. I'm getting Love Letter for them next, and hopefully Mice and Mystics soon - I've had M&M recommended every time I've asked this kind of question. I've gotten very good responses to Winner's Circle from girls of that age. The nicely colored horses are a real draw, and it seems that, in general, more girls are attracted to horses than boys. Perhaps Tales of the Arabian Nights. I believe some of the characters are girls (or could become girls depending on your fortune in the game). The game is story driven and non-confrontational. All the women in my family, wife and nieces, love this game. There's no characters in Zooloretto, but it's a cute set collection game that is super easy to learn and plays in under an hour. 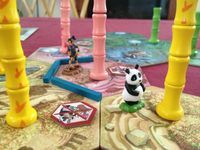 I will second, or is third now- both Zooloretto and Takenoko. Cute animals! 2 girls 6 and 8 - they love Forbidden Island and Hey thats my fish (no female characters, but I got the deluxe version and it has really nice penguins! Wildlife Safari - My 7 year old daughter loves this one. She also enjoys Qwirkle, Zooloretto, Sultan and Sheepland. Also, check out Dawn Under. My 4 year old daughter loves this one and holds her own.